Standing, from left: Producing Artistic Director Tim Dang, East West Players Board Chair Lynn Arthurs, and first place winner Eddie Borey. Seated, from left: Honorable mention recipient Lina Patel, third place winner Lauren Yee, and second place winner Madhuri Shekar. 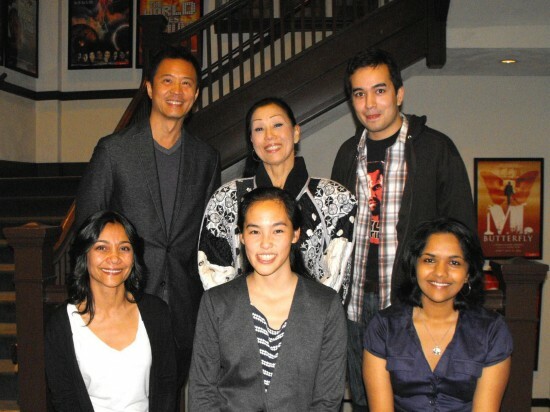 East West Players’ “Face of the Future” readings will take place Saturday, March 31, at the David Henry Hwang Theater, 120 Judge John Aiso St. in Little Tokyo. • “A Nice Indian Boy” by Madhuri Shekar (second place) at 2 p.m. Directed by Nico Raineau. Featuring Kyle Gundlach, Pramod Kumar, Puja Mohindra, Gita Reddy, Pia Shah, Karthik Srinivasan. Naveen Gavaskar just wants a traditional Indian marriage to a nice Indian … boy. While his parents are trying to wrap their heads around this strange idea, his older sister returns home and drops a bombshell of her own. A comedy about love and marriage today — gay or straight, arranged or not. • “Christmas in Hanoi” by Eddie Borey (first place) at 4:30 p.m. Directed by Jeff Liu. Featuring Francois Chau, Daniel Dugan, Christopher Goodson, Bach Hoang, Joseph Kim, Elizabeth Liang, Tohoru Masamune, Tamlyn Tomita. A mixed-race family returns to Vietnam for the first time since the war. One year after the death of their strong-willed mother, Winnie and Lou travel with their Irish Catholic father and Vietnamese grandfather to reconnect with their roots. Under the skin of Vietnam’s raucous cities, sleazy expats, and tourist-filled beaches, they find a past that is far from dead. Whether they embrace that past or reject it, the Ganleys are haunted by their own family’s ghosts and by the phantoms of Vietnam’s long history. Third place went to Lauren Yee, and honorable mention to Lina Patel. The James Irvine Foundation made the competition possible.